Visa-exempt foreign nationals : Bahamas, Barbados, Belize, Botswana, Brunei, Burundi, Cyprus, Dominica, Ethiopia, Fiji, Gambia, Ghana, Grenada, Jamaica, Kiribati, Lesotho Malawi, Malaysia, Maldives, Mauritius, Namibia, Nauru, Papua New Guinea, Rwanda, St Kitts & Nevis, St. Lucia, Saint Vincent & Grenadines, Samoa, San Marino, Seychelles, Sierra Leone, Singapore, Salomon Islands, South Africa, Swaziland, Tanzania, Tonga, Trinidad & Tobago, Tuvalu, Uganda, Vanuatu, Zambia and Zimbabwe. Nationalities NOT eligible for online e-Visa: nationals of these countries must obtain their visa in embassy: Afghanistan, Armenia, Azerbaijan, Cameroon, Eritrea, Iraq, North Korea, Kosovo, Lebanon, Libya, Mali, Palestine, Senegal, Somalia, Syria, Tajikistan and Yemen. Nationalities subject to visa and eligible for e-Visa online: citizens of all other nationalities can obtain their visa online (e-Visa), in embassies, or on arrival. 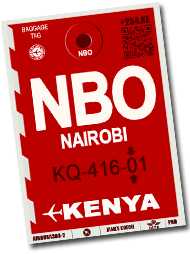 Note: a passenger who does not have Kenyan identity papers (passport or identity card) is considered as a foreign passenger even if he / she has a multi-citizenship and must therefore be in possession of a visa . Single journey visa : it is the typical visa to go to Kenya punctually for a tourist, professional or family visit. It allows to enter once in the country for a maximum duration of 90 days. The date of your trip must start no more than 3 months after the issuance of your visa. The fee for a single entry visa is US$ 51. Multiple entry visa: this type of visa is granted for several trips to Kenya. It is especially suitable for those who wish to travel several times in the country over a short period of time or for tourists who wish to make excursions to neighboring countries before returning to Kenya. The fee is US$ 101. East Africa Tourist Visa: this visa, issued by a convention between three countries, allows with a single visa to travel to Rwanda, Uganda and Kenya. This is a multiple entry visa valid for a maximum stay of 90 days. It costs US$ 101 and can be obtained at the embassies of Kenya if you start your trip in Kenya, of Uganda if you start your trip in Uganda or online on the Rwanda e-visa website if you start your trip in Rwanda. Transit Visa: issued to persons connecting through Kenya to other destinations for a period not exceeding 72 hours it allows to leave the airport for this duration. Those connecting flights directly without leaving the airport don't need to apply for transit visas. The transit visa fee is US$ 20. Courtesy visa: this is a visa issued to diplomatic, official and service passport holders coming into the country on official duties, or transiting through Kenya to a third country for official business or duties. It is issued free of charge / gratis. Work visa and other types of visa: these are specific residence permits that require additional formalities. Please contact the nearest Embassy of Kenya for more information. E-Visa online procedure : it is the simplest and the fastest way to get your visa. Citizens of the eligible nationalities (see above) can, within a few minutes, complete their application and pay their visa fees on the dedicated website. Only standard single entry visas, transit visas and courtesy visas are eligible for e-visa. With your scanned photo, your passport and your credit card you can obtain your visa by clicking here. Visa on arrival: if you have not had the time or opportunity to obtain your visa online, you can complete these formalities upon arrival at JKIA. Travelers' attention is drawn to the fact that the E-visa allows border checks to be passed more quickly. Standard procedure in embassies: if you are not eligible for the e-Visa or if the type of visa you wish can not be obtained through the e-Visa procedure, you can go to the nearest Kenya Embassy (see locations on the Ministry of Foreign Affairs of Kenya website, tab "missions abroads") with the required documents they asked you to bring.